From it’s misbegotten beginnings, the massive meltdown in 1917 to it’s heritage tied to the Wild West, the Morgan Silver Dollars has a storied and rocky past that makes it a favorite for coin collectors and investors alike. With prices starting around $25 and ranging upward all the way through the $250,000 mark, not only can a collector or investor buy into the Morgan Silver Dollar market cheap and work their way upwards as far as they want to go. This coins intrinsic or metl value alone makes the coin worth $11.53. That price is based on the current silver price of $14.98 per troy ounce. Where Did The Morgan Silver Dollars Come From? Back in the 1870s, the Comstock Silver Lode produced a huge oversupply of silver while the unemployment rate in the US was significant. The US Mint struck a deal with Nevada silver producers to generate a large amount of Morgan silver dollars. This provided an outlet for the oversupply of Comstock silver while providing employment to workers all over the country. Morgan silver dollarswere produced in 5 different mints and while the immediate goal of providing employment was met, so many Morgan silver dollars were produced that millions of them had to be placed in storage to prevent negative effects on the overall US economy. With so many millions of Morgan silver dollars in storage, the US government decided something had to be done. In 1917-1918, the Pittman Act was passed which made provision for some 300 million Morgan silver dollars to be melted down and the silver reused for other coins and purposes. The coins that were melted were from multiple years and from multiple mints which means that some years and mintages were virtually wiped out. This created a collectable coin market which made the Morgan silver dollar a very popular coin to collect as well as to invest in. Since so many Morgan silver dollars were produced, even after the melt-off in 1918, the US Mint still had several large stockpiles in hidden away in storage. Finds were being made as late as the early 1960s at which time a large cache of Morgan silver dollars were discovered. This brought to light thousands of uncirculated coins, some of which were considered to be rare years and even rarer mintages. In the 1970s, the US Mint held a sale of uncirculated Carson City Morgan silver dollars, introducing a new generation to high value coins at an easily affordable price. Today, while it does depend on the condition and the rarity of the coin, Morgan silver dollars have become arguably the most popular coin for both collecting and investing. 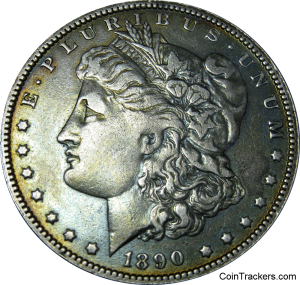 Coin prices rarely drop and with so many Morgan dollars available, the buy in for even the novice coin collector or a beginning investor is easily affordable. If you’re looking for a great way to start a coin collection, a great way to expand your coin collection or you want to find a great investment coin to enhance your portfolio and protect your investment dollars, going with Morgan silver dollars is definitely a great way to go.